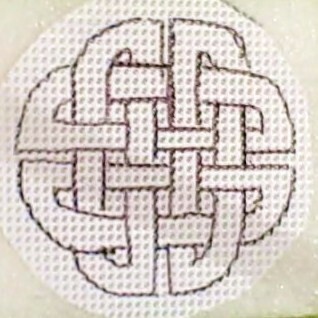 The Dewdrop motif is one of the foundation shapes in the Teneriffe Lace Weave Along. I love working with Lucet cords, and sometimes, I work with miles of them. So, I wanted to be able to make oodles of lucet cords more quickly. After a LOT of tinkering around, and much experimenting and many different iterations, I was happy with the prototype for the Latchet Lucet. I talked to Donna and Gary McFarland at Dewberry Ridge Looms to see if they were interested in making it. Gary is a master craftsman and excellent designer. It is a very happy tool for co-creating with the Thumbelina, Mollie Whuppie, Vasilisa and Star looms. (well…. any and all looms, really). It’s just sooooooooooooooo much fun! Many years ago, I had a wonderful dream about the Northern Lights. They were laughing, tumbling and frolicing in delight. It was a wonderful dream, and ever since then, I have designed and made variations on the theme of ‘Star Baby’. These woven Starbabies can hang up as ornaments or be pinned to a lapel or just played with as cute little dolls. FINISHED SIZE: Approximately 5 inches/12.5 cm tall. WHAT YOU NEED: Dewberry Ridge Star and Thumbelina Looms, Latch hook lucet from Dewberry Ridge Looms or a regular lucet. About an ounce/28 gm star colored yarn and about and ounce/28 gm yarn for the body. Face: 1 inch/2.5 cm diameter button and a 1 ½ inch/3 cm diameter circle of lightweight fabric. Needle and thread to gather the fabric circle. Features: Fine tip permanent marking pens, light pink crayon for cheeks. 1 Thumbelina arch shape following the instructions that came with the Thumbelina loom, also from Dewberry Ridge Looms. Fold the Arch shape in half. Stitch the Center back edges together to become the body. Leave the lower edge open. For the head, leave half of the arch not stitched. then place the button on the circle. Pull up on the thread to gather the circle of fabric tightly. Stitch in place on the back several times to secure the stitching. Draw the features onto the face. The seam is at the back of the body. Place the face button onto the head. Pull the edges of the head forward and over the edges of the button. Take the needle and thread through the back of the head and park it for now. 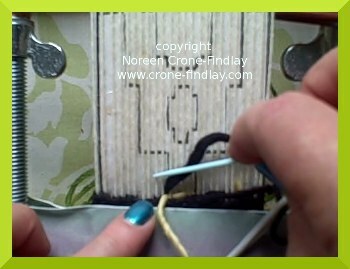 Thread a length of yarn into the weaving needle, then take the needle through the edge stitches. Pull up to gather the head around the face. Wrap around the neck several times. 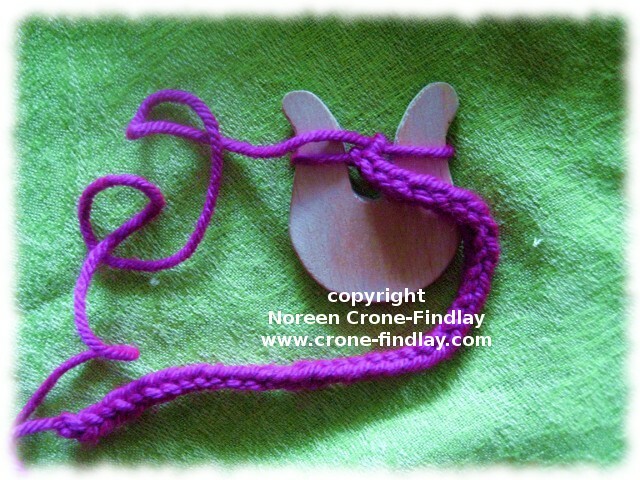 Take the yarn end to the back of the head and stitch in place to anchor it. Use the sewing thread to stitch through the back of the head to secure the face button in place. In Part 2, I’ll show you how to finish the Star Baby. A wreath is a cheerful and welcoming thing. 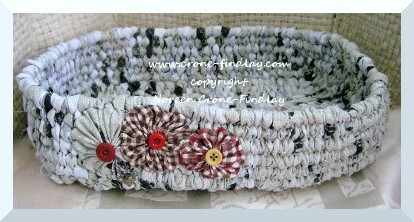 Here’s one that I have designed to be made with flowers woven on the Thumbelina loom. I used autumn colors, but you can make it with colors that match any season. Feel free to use as many flowers and leaves as you would like. I made the wreath by tying the vines shed by a weeping birch tree. I gathered them up, and shaped them into a circle, then wrapped the circle with thread to hold it together. I added a twisted wire hanger at the top. Yesterday, I showed a sketch of a tiny toy bunny rabbit that I designed. The bunnies are about 2 1/2 inches long and about 1 1/2 inches tall. 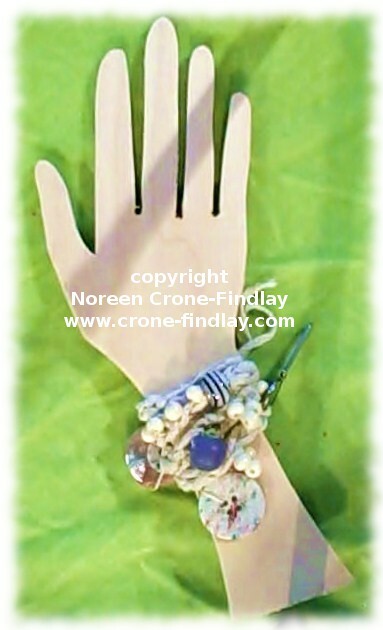 They are quick and easy to make and fit in a pocket or would make a great stocking stuffer. I have designed and made a very small lucet that is my all time favorite. It’s only 2 inches by 2 inches, and so it’s so easy to take with you wherever you go. 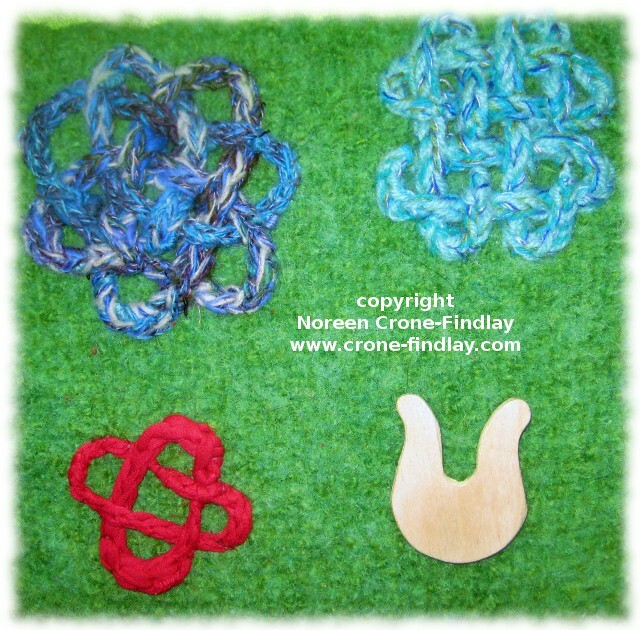 I’ve made 4 video tutorials that show how to use the Lucet to make cords, and then some wonderful things to make with them. 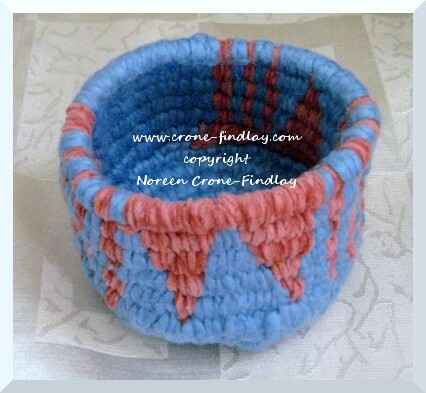 I love weaving baskets on small looms. 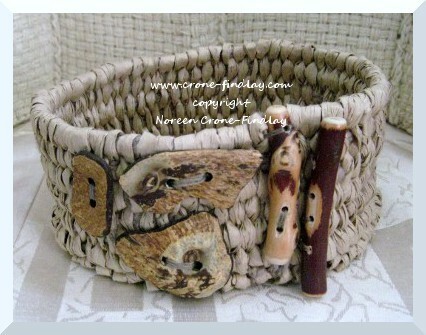 This basket was woven with paper ribbon and embellished with buttons that I made from arbutus twigs and coconut shells. The heart shaped basket has a plywood heart base (the template for the heart is included in the pattern). What can we use these baskets for? Anything that fits in them that you want to keep organized! 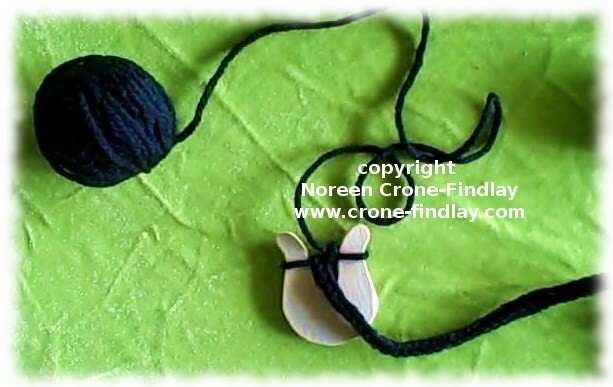 Beads, hair clips, packages of smallness, buttons, thread, bobbins, yarn…. 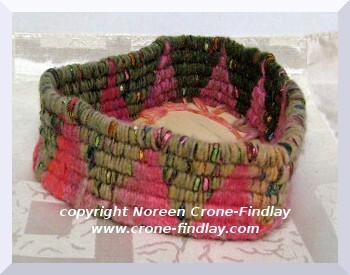 The large oval basket in the photo above was woven with strips of torn fabric, so it’s a great eco option. The yo yo flowers that embellish it’s side are made from scraps of upcycled fabric. (The instructions on how to make the yo yo circles are also included in the pattern). This basket is great for holding fruit or heaps of little green tomatoes while they ripen, or anything else your heart desires. Because it’s made of cloth, if it gets soiled, it can just be rinsed clean. 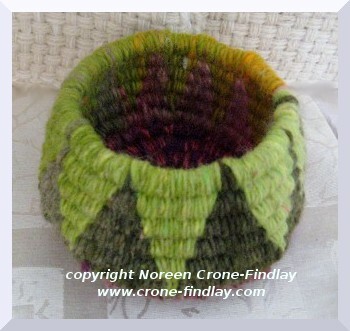 The green round basket is woven in the same way as the pink and blue one in the photo below, but I pulled up on the warp strands of the upper edges of the green one to curve it in. So you can see that a small change makes a huge difference in the look of the basket. 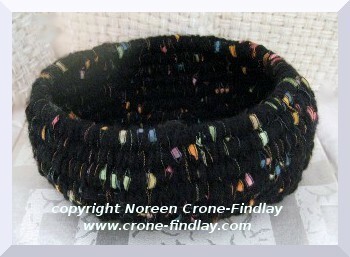 I did the same thing to curve the top edge of the black oval shaped basket that is woven in exactly the same way as the paper ribbon basket. 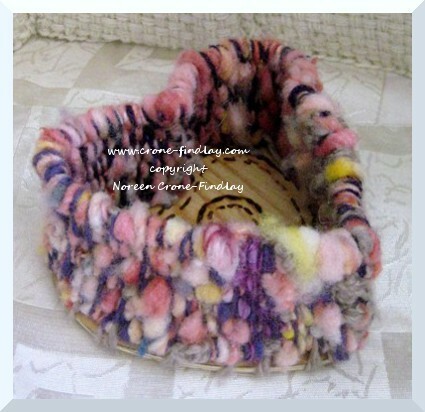 The yarn that you use (combine several strands to get neat effects) and how you embellish the basket will guarantee that each basket that you make is totally unique. Another set of baskets that I designed has recently been released on the Lion Brand website. 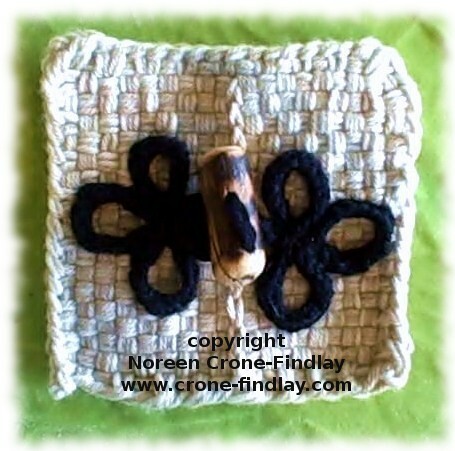 I designed some rectangular baskets, embellished with dragonflies, for the Martha Stewart loom. The video for Part 4 of the Soumak Pouch Weave Along is a really big one because it’s the ‘how to’s’ for the actual weaving of the pouch. And, at one point, I called the weft, ‘warp’…………. oh sigh…………. so please forgive me for the errors. Luckily, pretty quickly, I do say the ~correct~ thing. But still……….. arghhhhhhhhhhhh…………. And, no, I am not willing to re-shoot the video….. there are days and days and days of shooting, and so I am not going back to do it again. Anyhow…. I hope that you will have a WONDERFUL time weaving your pouches!